Last week the Tapestry was covered in local press at opposite sides of the globe! The John O'Groat Journal in the north of Scotland covered the story of the Caithness to Patagonia connection (above). Meanwhile the Times Colonist in British Columbia, Canada, was telling of the contribution of the Embroiderers Guild of Victoria. You can read the article here. Whilst the studio swarms with volunteers, blocking the finished panels and preparing them for exhibition, we've been taking the opportunity to sneak a few panels out to appropriate homeland communities. Four panels detailing the life and works of John Muir visited his birthplace in Dunbar for the John Muir Festival, before moving on to the Prestoungrange Gothenburg in Prestonpans where they remain visible until 27th May (just before the launch weekend). That means visitors can see the John Muir mural on the waterfront before crossing the road to the pub and viewing the panels (maybe even trying a bottle of the special John Muir ale too!). The panel depicting the Gothenburg Principles, by which a proportion of pub profits are returned to the community, is also on display alongside the John Muir panels from Dunbar, Wisconsin and California. A selection of panels from India and Pakistan visited the Nari Kallyan Shangho community group's base in Edinburgh last week, where volunteers who worked on different panels were able to admire each others' work. And the panels from Veere in the Netherlands travelled to the beautiful Culross Palace in Fife. There is a rich history of trade links between the royal burgh and Veere, beautifully symbolised by the Dutch pan tiles roofing the splendid palace. You can find out more about our Homeland activities on the dedicated web page here. 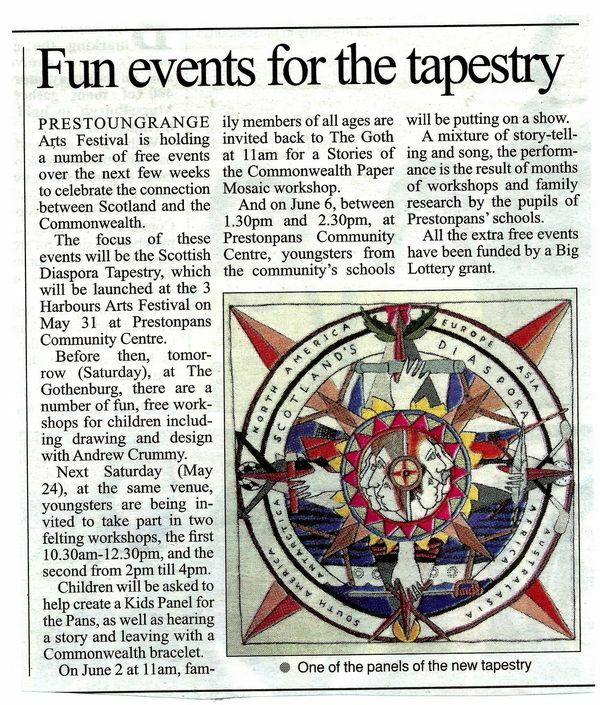 Following a successful grant application to the Big Lottery Celebrate Fund, Prestoungrange Arts Festival will be holding a number of free events over the coming weeks to celebrate the connection between Scotland and the Commonwealth, in support of the Tapestry's World Premier in Prestonpans. 17 May (10.30 -1pm) The Prestoungrange Gothenburg, Prestonpans. Fun workshops for children, including: drawing and design with Andrew Crummy; storytelling; learning to stitch; and s felting workshop: drop by and make your bracelet or badge in colours of the Commonwealth. Then help make our The Commonwealth Family Tree by adding your own felt leaf to its branches. Learn how to stitch with the diaspora tapestry team. A great opportunity for the kids of Prestonpans to participate in one of two felting workshops. Help us felt a children's PANEL FOR THE PANS, hear a story and leave with your own Commonwealth Bracelet. Children should be accompanied by an adult. Booking essential tel 0750 3034019 or 01875 818684. Children, parents, grandparents, family friends are invited to join us for our "Stories of the Commonwealth Paper Mosaic Workshop". Listen to some myths and legends of India, New Zealand, South Africa, and Scotland then create your own paper mosaic of a symbol from your Commonwealth country to bring home. Students from Prestonpans Primary, Prestonpans Primary, St Gabriel’s and Preston Lodge High Schools weave together the threads of their own family history, and present them in story and song. Come along and enjoy this performance, which is the result from months of workshops and family research by the pupils of these schools. Just come along! Prepare to be delighted by the talent of the Prestonpans schoolchildren as they sing and tell their own diaspora stories and connections to the Commonwealth.